Brief Description A combination of oils, tincture and essential oils to relieve and prevent the discomfort of fleas and ticks. Indications Fleas Full Description Base Oil: Neem and Grapeseed: Neem is a traditional Indian remedy for lice, fleas and scabies. . Tincture: Quassia (Picrasma excelsa): Noted insect repellent. 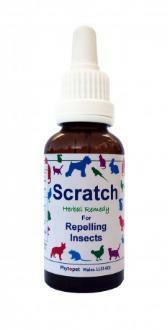 Used as a skin wash for fleas, scabies and other parasites. Essential oil blend: Lemon, Grapefruit, Orange, Citronella, Eucalyptus, Cedarwood, Sage, Lavender. Insects hate the smell of these oils. Egarlic, either powdered or capsules, can help keep parasites away. Suggested use: External Use Only.. 2-5 drops directly onto collar, or add 5 drops to 20ml of olive oil, soak collar overnight in mixtur refresh weekly. Add 30 drops of blend to 100ml water, use in spray to treat pet bedding etc. Add 20-30 drops of mixture to 200ml of pet shampoo.